Distinguished B/W Performance, Compatible with Color BW entry level hcu with 15" monitor and 2 transducer sockets. 64 phys. channels, 5 imaging levels. 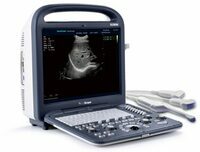 Endowed with SonoScape's advanced imaging technologies and optimum workflow, S2BW is more than a new compact black and white portable ultrasound unit with comprehensive functions. Truly exceptional image quality combined with professional diagnosis applications and ergonomic design help bring with you refreshing experience: confidence, accuracy and comfort. Upgradable to a comprehensive color Doppler system offers a lasting chance to achieve more in the future.